We first explored who was part of a food desert. This included the immediately affected areas and the people who live there, as well as outreach programs and people on the outside trying to bring awareness to the existence of food deserts. How do you think food access impacts one’s health? How does your job or your volunteer work help to address the food desert issue? For Pediatrician: Do you have patients who live in food deserts? What common diseases do they have? Are these diseases directly related to unhealthy diet? Does other family member suffer from the same diseases as children? Who are the main source of health education (parents, school, friends) ? How would you help your patients to engage in health education? For Registered Dietitian: How does the diet of someone live in a food desert affect their overall wellbeing and health? What are the factors that contribute to dietary behaviour at a household or ‘family’ level? How would you help someone change their lifestyle habits who has lived in a food desert? For School Administrators: How many students are affected by food deserts within your school? How does being located within a food desert affect students? Does it affect their learning/focus or health/attendance within the classroom setting? What is the school’s outreach for those families that are affected by lack of access to healthy food? For Parents: What are the biggest challenges of living within a food desert? Tell me about where you buy fruits and vegetables. How far do you travel and how long does it take you? (Follow up: Why? Or I’d love to hear more about your transportation.) Are there programs or Urban Gardens that you may participate in? 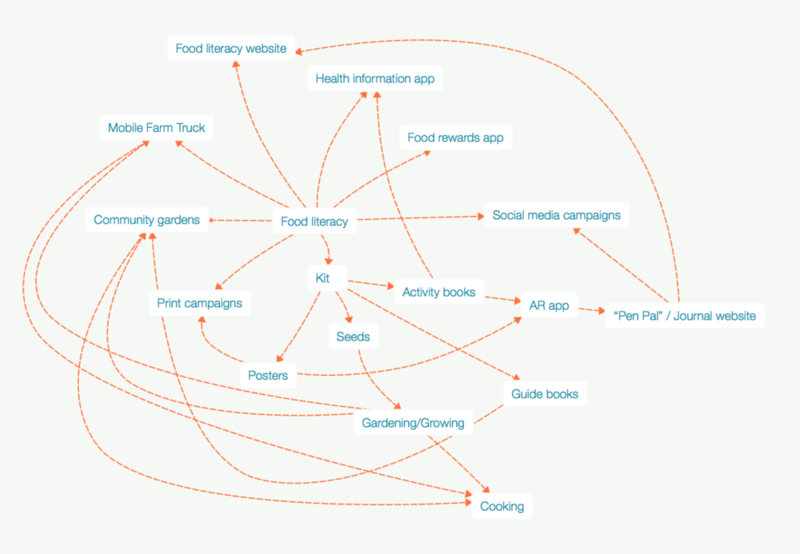 What is the community outreach for living within a food desert? What kind of fresh foods do you try to incorporate into your daily routine that are more nutritious, if any? How do you get access to those foods? What is the biggest change within your community that you would like to see in order to help eliminate food deserts? For Student: (If possible) Do you provide your own meals for school? “Pack a lunch? Or eat at school?” Why? What kind of meals are you provided with? What kind of education is being provided on food, health and nutrition? Are there programs or Urban Gardens that you may participate in? 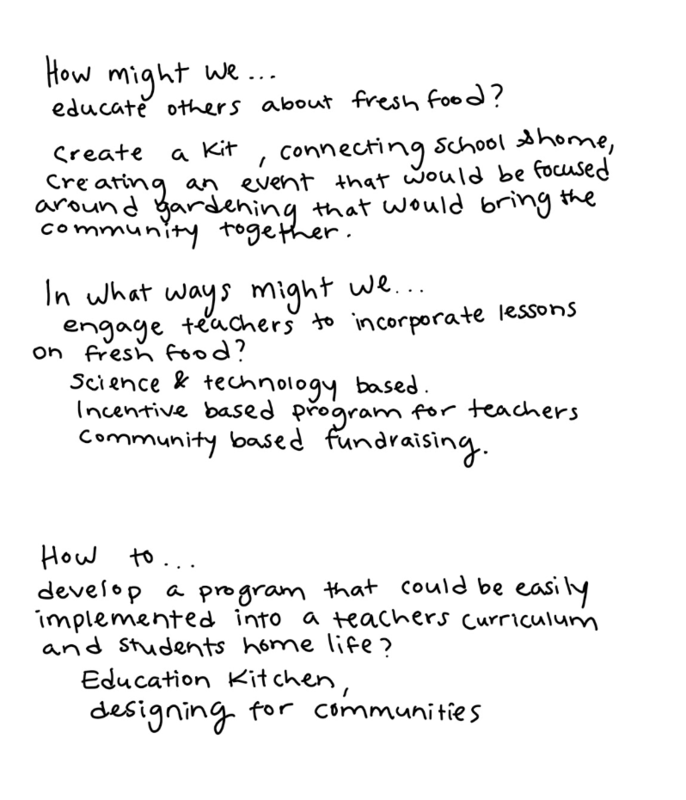 Would you be interested in being a part of an Urban Garden within your community of school? For Chefs & Campaign reps: What inspired you to join the #DrinkGoodDoGood social media campaign? How can restaurants play an active role in raising awareness of food deserts? Student who lived in a food desert: What was done to improve the situation while you lived there? If you wanted fresh groceries, how did you go about getting them? Did you know you were moving to a food desert? For holistic health practitioner: Do you have patients who live in food deserts? How does the diet of someone live in a food desert affect their overall wellbeing and health? How would you help someone change their lifestyle habits who has lived in a food desert? For Health in the Hood: What makes your program unique from other food desert outreach efforts? How has your program affected the food desert population? Did raising awareness about food deserts lead to other benefits as well? How were the head gardeners selected? For an urban gardener: Why do you participate in an urban garden? How has your experience changed (or not changed) your ideas about food? What would you like people to know about urban gardens? What benefits do you believe you have received from growing your own food? https://www.miamiherald.com/living/food-drink/article99235392.html Using social media to raise awareness of food deserts. https://feedingsouthflorida.org/our-programs/produce/ Feeding South Florida organization. https://feedingsouthflorida.org/walmarts-fight-hunger-spark-change-campaign-benefits-feeding-south-florida/ Walmart joins campaign with Feeding South FL. Right now we are leaning towards the angle of how to bring help into the community and raising awareness to the general public. We were very inspired by the social media campaign and are continuing to research how technology and social media can continue to impact these communities. We hope to launch a project with this tech/social media focus. Specifically within this focus are two great sources- Jeremy Ford and Michelle Bernstein, who run local restaurants and are world-class chefs. They both were representatives for social media campaigns that brought tons of fresh food into local Miami food deserts. It will be interesting to get their prospective as chefs and also as community reps. Interviews should be next week. This picture was part of an Instagram post that used the #DrinkGoodDoGood social media campaign. Naked Juice donated 10 pounds of fresh produce to a community in need for every selfie posted with a fruit or vegetable with this hashtag. Today we all went to the farmer's market to interview Roger Horne and representatives of Urban Oasis. Something that very eye-opening -and apparent in hindsight- is the lack of communication between the existing groups that are currently working to raise awareness of and end food deserts. Social media & technology were seen by Roger as having great potential, while Urban Oasis members Jeannie and Art were a bit more hesitant. A new angle we are exploring for our project is weaving together these current organizations and their goals. It is also important to mention that specifically after our talk with Roger, we are now exploring the idea of creating a network that unites organizations that share common goals- this would maximize impact by reducing repetition and allowing analysis for what worked and what did not. As Roger said, people need to step out of their individual missions and look at the bigger picture. Interviewing a student who lived in a food desert. Today I interviewed my friend Jonathon, who lived in a food desert while attending undergraduate university. What was most interesting about my interview with Jonathon was discovering that he wasn’t aware that he was in a food desert until he moved away. I was surprised that this was not an area that was addressed by the university for incoming students, but Jonathon believes that the university feels it is addressing this by providing nine different food courts and cafeterias for students to eat in on campus. However, this still does not solve the problem of bringing fresh food access to students. The biggest issue for Jonathon was transportation to the nearest grocery store. A valuable idea of his was creating a grocery carpool app; this would save time (it took 30 min on public transit to get to Aldi) and would allow you to stock up on groceries (a bike can only carry so many bags). Another idea I had as a result of this was addressing the concern of the food desert environment during student orientation at the university. The university should provide means of transportation to large produce stores (similar to what UMiami offers to students for access to Whole Foods, Publix, etc). Interviewing a chef who helps raise awareness of fresh food accessibility. Today I received answers from Michelle Berstein, Award-winning chef, previous Food Network co-host, and current host of “SoFlo Taste”. She was raised in Miami and knows the local effects of food deserts. She was a spokesperson for a campaign sponsored by Naked Juice and Whole Wave (This organization also came up in another interview) that used social media to promote awareness of food deserts. She sees a lot of potential with social media because it’s quick and efficient, and it’s a way for people to be “at the heartbeat of what’s happening in the world”. We discussed that this is a topic that is not discussed enough, or people misunderstand the concept. The urgency of the situation needs to be addressed, which is a perspective I hadn’t considered- urgency. All of these organizations keep going in circles trying to achieve their individual issues, without addressing the urgency of the entire movement. Chef also discussed that restaurants need to keep it a live conversation, especially through the staff that are in the dining room; people want to know where their food came from and this leads into a conversation about availability of fresh food. Interviewing an English professor who promotes health to her students through their research topics. University of Miami English Professor Katherine Komis is using her class curriculum to raise awareness about health literacy and the processed food industry. Her focus is on the interactions between health, wellness and the environment. She believes that the future of health literacy depends on today’s young children, and believes that we need to use technology to help these children learn more about the importance of eating healthy food via computer games, apps, etc. An example she had was growing a virtual garden: this teaches students how to grow certain types of food, while also helping them understand garden maintenance. Other modifications to standard children’s toys would be successful, as well, for example: fruit and vegetable ABCs. Universities should also be doing more to raise awareness to students- putting healthy food court options isn’t enough; students need to be educated on why they should be eating healthy. A great idea she had was to steal tactics that food advertisements use- powerful graphics that anyone can relate to. She believes that this movement towards healthy eating could have a lasting, strong impact with the help of a campaign like what was done for tobacco smoking. Attached is part of the interview transcription. Professor Komis went on to talk about a program that brings fresh food to convenient stores. She also brought up the importance of having incentives. For instance, in NYC, people who want to get a license to be a vendor will get their license quicker and cheaper if they are selling fruits and vegetables. She compared the seriousness and potential of this campaign to the anti-smoking campaign. She believes we should go straight to the schools to start promoting this awareness, which is exactly what programs like D.A.R.E. did for awareness about tobacco. The most important takeaway for me was her talk about advertising. Food companies advertise their processed food to give the impression that it is healthy, and it has appeal to all kinds of people. Can we do the same, to promote health literacy and fresh food? We have by now prepared a project prep worksheet, three empathy mappings, and are currently working on creating personas that are derived from this mappings. Deb found an amazing free template for user personas that can be found here. This really helped us put into words what the problem was, and how we would measure our success. This empathy mapping contributed to creating the Patrick persona below. This contributed to our Anna persona, listed below. Empathy mapping of a student. This was used for our Ashley persona listed below. After receiving feedback on our personas, we narrowed down our target users to be teachers and students. The teacher persona was modified to fit our product better, mainly by changing his level teaching from university to elementary. During the course of our interviews and later the development of our personas, our focus shifted from looking specifically at food deserts to the more general and pressing matter of food and healthy literacy. People who don’t have access to fresh, healthy food can be resistant or wary to changes in their community that provide them access to it. On the other hand, people who do have access to fresh food are unconsciously or consciously choosing not to purchase it. There was also much discussion of the growing disconnect of how food gets from the farm to the table. Multiple interviewees also brought up the effects of unhealthy food advertising on all populations. Most agreed that technology and social media could play a larger role in promoting health literacy, and all agreed that kids were should be the target audience for any promotions and awareness programs. Integration into the culture of the local community was emphasized as a key factor in the success of any initiative. We had three great personas, but still had not narrowed down our idea scope; if anything it seemed to get bigger! From non-profits to educational farms, there are many organizations out there whose sole purpose is promoting health literacy. Some groups have already embraced a technological approach to appeal to the younger generation. However, there seems to be a general lack of a direct connection to schools. Teachers connecting with students who then can bring knowledge home to parents could potentially be the most direct way to impact a local community and influence its future. Integrating a modification of one of the ideas presented in our design precedents with the school system might present an alternative solution. As our personas are refined and storyboards are drawn, it seems that the direction we are going in will involve flexible educational kits. Our target audience has been established as being students, which will be facilitated in the classroom by the teacher and then brought home to the family. A classroom tech component will compliment the take-home, hands-on kit. Farmers could also be involved in this- offering kits at farmers markets, dinners with students, parents and schools to raise awareness about food sources, etc. This was our concept poster. The main criticism we received involved not being specific enough with our illustrations and responses. Our user flow (see above) helped clarify some of those ambiguities. From here, we created storyboards for our three personas that eventually led to our prototype user flow. Click the photo below to go through the specifics. We decided to use this method of user flow instead of a flow chart because of our product is not technology centered. It was important to emphasize in our presentation that the AR is just an additional feature to enhance to experience; students who do not have access to it can still have an enriching learning experience. Since we added an augmented reality component, we created a user flow for this optional add-on. This is a theoretical approach to our supplementary AR component. An app would be downloaded onto a smart phone or tablet to scan pictures and upload photos. Scan pictures would lead to additional factoids and games involving the specific fruit or veggies. Uploading photos can “unlock” levels or points for users (primarily the students) as motivation to continue working on their gardening skills. We decided to perform several LUMA exercises to understand our users and audience better. To gain this additional insight, we went through the Rose, Thorn, Bud exercise as well as one additional exercise, “Statement Starters”. Our project meets our initial objective: Design a system that covers the spectrum of health for populations. People have different relationships with food, even for upper middle income households. Food choices and decisions may not be “healthy” regardless of income or proximity to healthy food. From here we can include the local community through fundraising efforts and dinner events that can also involve farmers. The AR component can also be expanded. Teacher and student editions of activity book, gardener guide, seeds and educational posters that are AR compatible. The activities book for kids includes a mix of games, color-in fruits and veggies, and free form drawing spaces with fun facts. The pre-drawn images can be activated for additional content via the AR app. 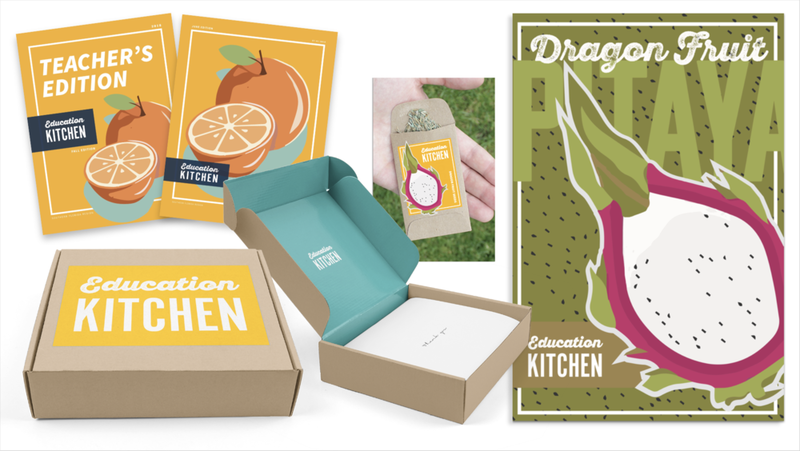 Education Kitchen overall was well-received and we got some great feedback regarding using BlippAR to create a working app and a suggestion to add illustrations to the recipe pages so that kids can also color those pages; perhaps while an adult in the house cooks, the kid can color. We received some nice compliments on the presentation and visual direction. Additional feedback included discussion about community gardens and how in underserved populations, land is at a premium with many most likely living in apartment complexes. This would shift the community garden to the schools but even then, land might not be available. Roger Horne spoke about this aspect and why he doesn’t see “community gardens” as a solution. Community gardens are not part of our solution but Clay’s point is a good one. Perhaps we need to include something about gardening in containers or hydroponics. On the tech side (AR), Clay spoke about “unlockable items”. Perhaps we didn’t speak clearly enough about how the technology is a bonus layer. So, IF schools have access to wifi and a device that could support AR apps, then the students benefit from this feature. Still, he did encourage us to think about how the AR aspects could be more than nutrition information; something really special and I think this is where he was saying it could tie into a website layer as well; an opportunity to educate at a global scale from a local level. Deb created this fabulous concept map for us to look at how we ended up where we did. We came a long way! We simplified the design for a clean, modern look with a splash of a handwritten style. We created the base workbook pages as activities that revolved around the plants life cycle, from seed to table. This workbook version only included pages for the tomato since that is what we were prototyping, but ideally the workbook would have sections dedicated to each seed packet that is contained in the kit. For initial user testing, a five-year-old child and her parent used a prototype of the kit that involved coloring pages and recipes. The augmented reality component was discussed but not realized. There was general confusion about the AR component. The child was excited to see that one of the recipes was pizza, to the point of being distracted from the other workbook pages. The second round of user testing involved the additional stakeholders of a kindergarten teacher and a nanny. This time we added a new interactive element to the recipe section where a child “follows along” with the real-life recipe by creating recipes with stickers of ingredients. The nanny was supportive of this addition and enjoyed the prospects of a child being able to interactive with the workbook without a needed augmented reality component. The teacher pointed out the lack of a nutrition page in the book, which is key in tying together healthy eating with fresh produce. This page was added in the form of a “Let’s Play!” page, which features a word search. She also pointed out the need to create real-life scenarios for the child to follow along with, instead of just imaginary characters and theoretical ideas. We went though many changes with AR and eventually settled on a simple solution that could be considered a fancy QR code: Anytime a variation of Tom the Tomato is in the top right hand corner, the page is meant to be scanned with our mobile app for additional content. Based on our user feedback, we made this additional content based on real-life scenarios, such as Tom talking with a real life farmer in a video. The other scenarios were Tom talking with a gardener, Tom showing how to pot the seeds, and Tom talking with a chef. Again, these videos stress real life application and also the life cycle of the seed. We have limited knowledge of AR, so we are building off of the assumption that AR can be activated by the colors on the page that kids have completed (The entire page would be scanned). We also included an AR element that could help keep track of plant growth. The Education Kitchen pot would be scanned at various stages of growth for additional information at each stage. A big part of our concept was bringing a fulfilling, unique experience to kids regardless of access to technology. Which lead us to incorporating stickers- who doesn’t love stickers? The workbook comes with stickers that correspond to the different ingredients required for each recipe. Children are in charge of “mixing” these ingredients on the page, while mom and dad help them with the recipe in real-life. We struggled with coming up with a way of presenting nutritional information in a manner that kids would find interesting. We settled on a traditional word search so that at least the terms would start to sink in while kids are searching the puzzle. EDIT: Rebecca had a great suggestion of incorporating nutritional fact vocab into this, so that kids can start learning how to read nutrition fact labels. This is a great real life application. The general content of the box remained consistent with the original project.